Have you or a loved one experienced the setback of an accident recently, or found yourself in need of a wheelchair or scooter due to the effects of a progressive illness? If you have, you may be in need of a ramp or stair lift for accessibility at your Atlanta or north Georgia home. Wheelchair and scooter ramp construction details and specifications vary substantially and require careful consideration as you plan to build or install a ramp. Attention must be given to slope, landings, railings, weight classifications, threshold ramps and more. Whether you are seeking to solve a temporary accessibility issue or require a permanent ramp solution will affect the ramp selection. For a temporary ramp, rental of an aluminum ramp may be most feasible. For a permanent ramp, both wood ramps and aluminum ramps work well. It is always a frustrating thing to realize that what was once a simple, complacent action has suddenly become so difficult as to be almost impossible to perform. Nowhere is this more obvious than when age or disability has made going up and down stairs a challenge and even a safety hazard. Thankfully, home modification specialists have anticipated these moments of potential crisis and ensured the smooth transfer from one season of life to the next. And the stair lift and its features have become a boon to those with age or disability-related mobility issues. 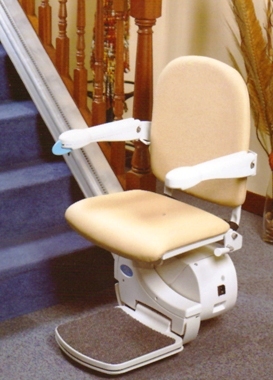 Beyond the obvious advantages, stair lift features include hinged tracks for efficient performance in tight spaces, powered swivel chairs for safe seat-to-landing transition and folding footplate, safety harness for extra security, slide tracks, foldaway lifts to conserve space, and a battery back-up. These options could be of immediate benefit or be useful further down the road. So many stair lift features rolled into one mobility device — all designed with one particular goal in mind, to offer that extra peace of mind needed to live in independently, in comfort and safety. These ramp and stair lift features solve mobility problems both indoors and out. Contact Atlanta Home Modifications, LLC today at 770.880.3405 to discuss your accessibility options, or to set up an appointment for an in home evaluation by a ramp designer or a lift specialist who is certified by the State of Georgia. We will assist you in the installation of a ramp, lift, elevator or stair lift chair that is exactly suited to meet your accessibility needs.